In the ever-expanding world of film, there are summer action flicks, and there are critically acclaimed dramas, and rarely do the two categories intersect. But Snowpiercer, the post-apocalyptic drama film from South Korean director Bong Joon-ho, manages to pull off this feat. Released to a limited number of theaters on June 27, the film stars Chris Evans (Captain America: The First Avenger), Tilda Swinton (The Chronicles of Narnia series), Ed Harris (A Beautiful Mind) and Song Kang-ho as key players in a story about violence, class segregation, and one extremely long train. The events of the film take place nearly two decades after a failed environmental experiment covers the entire world in uninhabitable ice and snow. The final remains of the human race, only a few hundred people, survive aboard the titular Snowpiercer, a futuristic train equipped with a perpetual-energy engine that allows it to constantly run laps around the entire frozen globe. The human population onboard is separated into a more privileged upper class section, a filthy and overcrowded lower class section and the soldiers tasked with keeping the two classes separate. The residents of the lower class tail section, led by a man with a dark secret in his past (Evans), stage a revolt in the hope of overtaking the front engine room of the train. However, to get there, the group must battle their way through armed guards, locked doors, and even outer-obstacles encountered on the tracks themselves. Snowpiercer takes the standard apocalyptic-thriller setting and compresses it into what is essentially a very long hallway. Viewers are treated with brief glimpses of a frozen world through the windows of a train carriage, while what is left of the human race fights for survival inside. Such close quarters allow the characters to interact, clash and blossom, resulting in an action film that draws its greatest strengths from its actors rather than its effects. In his leading role, Evans gives what is perhaps his most gritty and emotion-filled performance to date, far surpassing his enjoyable yet tame roles in the past as an on-screen member of both The Avengers and The Fantastic Four. Song breathes life into the character of the drug-addicted train engineer who speaks only Korean, and Swinton gives a classic performance as the certifiably insane, bloodthirsty leader of the upper class citizens. With a cast including two Academy Award winners and several nominees, Snowpiercer certainly has the benefit of experience on its side. However, while the film can consistently rely on its players to hold itself up, audiences may be thrown off by the rapid and often unexpected shifts in tone throughout the plot. As the band of revolutionaries move closer and closer to the front of the train, the amount of tension within each scene changes swiftly; one minute the heroes are battling through an army of axe-wielding soldiers, and the next they are quietly interacting with an innocent group of schoolchildren in the middle of a lesson. These shifts from brutal violence to relative peacefulness are jarring and separates it even further from the standard action-packed blockbuster. 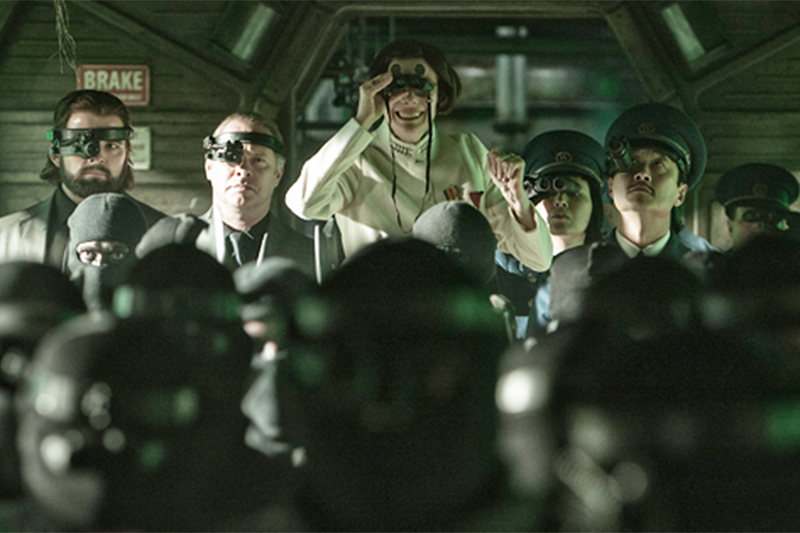 All in all, therein lies the key to Snowpiercer: Sure, the well-worn post-apocalyptic ideas of human struggle are there, but it is the manner in which director Bong introduces these ideas within the film’s setting and characters that makes it a success, both as a bridge between the Asian and North American film industries and as an action film in general.